Pisces Sushi and Global Bistro is a modern casual fine dining restaurant that features global cuisine and global inspired sushi rolls. The expansive menu features a selection of appetizers, salads and soups in addition to beef, poultry and seafood entrees. Chef James Keene takes familiar sushi roll ingredients and ingredients found in international dishes to create his exotic and delicious rolls. The Aztec Sushi Roll includes traditional ingredients like Shrimp Tempura, Cream Cheese, Avocado and Seared Tuna mixed with the Aztec influence of Black Bean and Corn Salsa, Chimichurri Sauce and Plantain Chips. 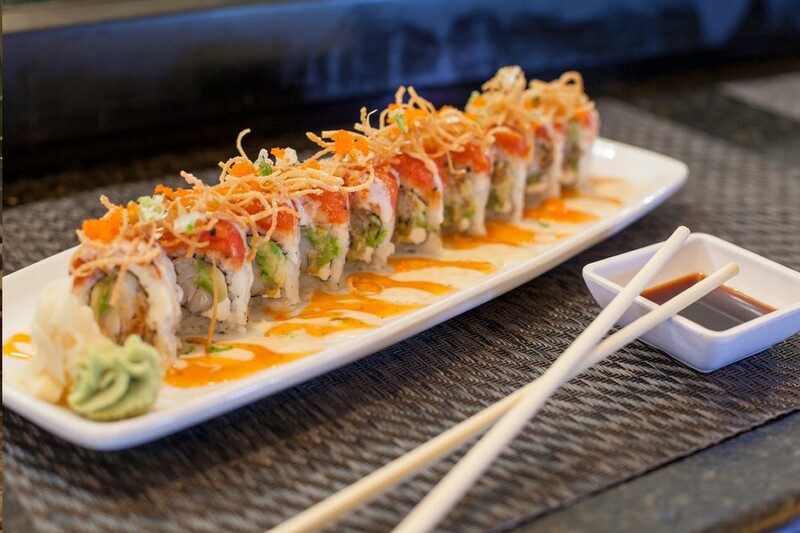 The Aphrodite Roll includes Steamed Shrimp, Black Tobiko, Scallions, Avocado and Salmon with the Greek influence of Tzatziki Sauce, Feta and Sundried Tomato. Some of our “First Flavors”, mouthwatering International inspired Tapas style appetizers, include Tuna Guacamole, Shrimp Shumai and Cuban Crab Cakes, White Truffle Edamame, and Chimichurri Marinated Angus Filet Skewers. Other Non Sushi Dishes include, Stir Fry, Pork Belly Steam Bun, Bahn Mi Sandwiches, Wasabi Cesar Salads, Crab Bisque and Greek Salad. We continue our world tour with our “Finishing Touches” –Tiramisu “Straight Up”, Crème Brûlée Flight and Mochi Ice Cream. We also offer a delicious “Just for Kids” menu for kids under 12. From our main seating dining room you will be able to enjoy our beautifully lit sushi bar. We also offer a semi-private dining area for large parties. – Come and be our guest on this culinary tour around the world!